Note: Click to see maps of the Stony Creek Raid, which should help you follow along with the action. Brief Summary: From December 7-12, 1864, 150 years ago this week, Gouverneur Warren led a major raid down the Petersburg & Weldon Railroad, attempting to put it out of commission down to Hicksford , Virginia, well south of Petersburg and Richmond, and 44 miles south of Grant’s headquarters at City Point on the James River. In the month of November 1864, Ulysses S. Grant was on the lookout for signs that Robert E. Lee was detaching troops to help oppose Sherman’s March to the Sea. He ordered George Meade to send out several cavalry scouts in November and December to probe the Confederate cavalry screen in the direction of their supply depot at Stony Creek on the Weldon Railroad. Grant also considered ways to proactively prevent Lee from sending troops away. One of those ways was to have Butler abandon either Bermuda Hundred or the lines he captured north of the James River during the Fifth Offensive. Those troops would then assume the positions held by Meade’s Army of the Potomac east and south of Petersburg, freeing Meade’s entire army to strike out away from the City Point Supply base, get far into the Confederate rear, and end the campaign. Grant was hesitant to try this approach, a high-risk, high-reward attempt to end things at one fell swoop. Army of the James Chief Engineer Peter S. Michie proposed another plan, this time focusing on Bermuda Hundred. He thought the Confederate Howlett line could be broken, and the Petersburg and Richmond Railroad reached and held. The plan was simply to break the direct connection between Richmond and Petersburg, interfering with Lee’s ability to quickly move troops and supplies where they were needed most. In the end, Grant chose none of these options. In early December, the Sixth Corps began arriving at City Point, fresh from its victories in the Shenandoah Valley under Phil Sheridan. Grant realized he could get a jump on Lee, using these reinforcements to his advantage before Early’s men could reach the Richmond/Petersburg front. Ultimately, he did so, shuttling Wright’s Sixth Corps divisions into the lines around Petersburg, freeing up Warren’s entire three division Fifth Corps and Mott’s Division of the Second Corps for Grant’s offensive designs. 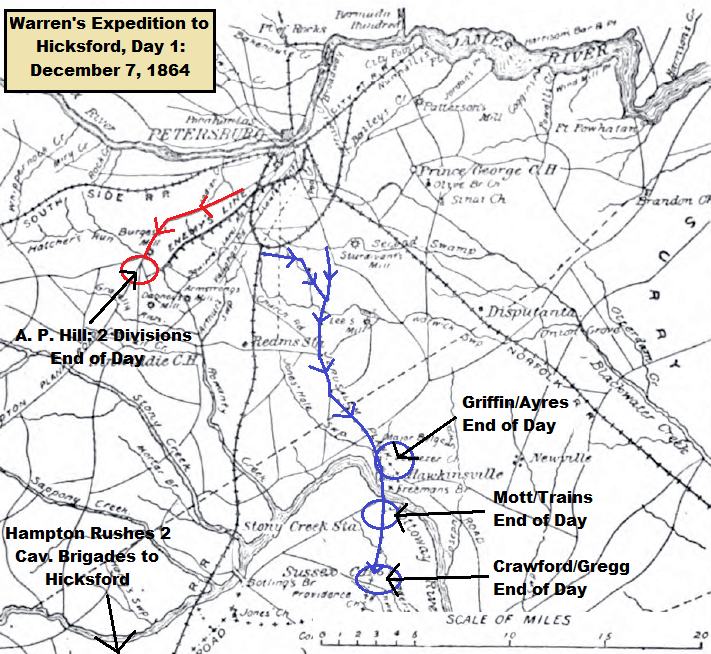 The offensive design chosen is the subject of this post: Gouverneur Warren’s Raid to Hicksford. As is so often the case during the little studied Siege of Petersburg, this raid goes by at least a half-dozen names: Hicksford Raid, Applejack Raid, Stony Creek Raid, Nottoway River Raid, Weldon Railroad Raid, and Belfield Raid. I’m sure other names were applied to this raid as well, both by the soldiers who participated in it and the historians who have studied it afterwards. To make matters even more confusing, there is the question of where this raid fits into the larger structure of the Siege of Petersburg. Richard J. Sommers, author of the classic book Richmond Redeemed, about the Fifth Offensive, considers this raid and attendant skirmishes to be Grant’s Seventh Offensive against Petersburg, with the February action the Eighth Offensive, and everything in March-April to be the Ninth and final offensive. I have used this approach at The Siege of Petersburg Online. Earl J. Hess, in his excellent book In the Trenches at Petersburg, utilizes a slightly different approach. The first six offensives remain the same. Warren’s Raid is considered just a raid, similar to Sheridan’s Trevilian Station expedition, the Wilson-Kautz Raid, or Hampton’s Beefsteak Raid. The Seventh Offensive is in February, and the March-April operations are considered the Eighth and Ninth Offensives.1 The end result is that we are discussing a raid with at least six names and an uncertain place in the greater Petersburg Campaign. Keep that in mind if you are interested in studying this action beyond this post. With that lengthier than expected aside out of the way, let’s move on to what I’ve chosen to consistently refer to as Warren’s Stony Creek Raid. Gouverneur Warren was assigned the task of moving down the Weldon Railroad, wrecking it to Hicksford, Virginia, a town about 44 miles south of Grant’s Headquarters at City Point and only 10 miles from the Virginia-North Carolina border. To accomplish this, he was given approximately 22,000 infantry and 4,200 cavalry. The infantry consisted of his own three Fifth Corps divisions under Crawford, Griffin, and Ayres and Mott’s Division of the Second Corps. The men were given 60 rounds of ammo and 4 days rations to carry, with 40 more and two more in wagons One battery of artillery accompanied each infantry division in support. Much of Gregg’s Second Cavalry Division provided advance scouting and screening duties for the exposed column. Gregg’s Cavalry set out down the Jerusalem Plank road at 4 a. m. on the morning of December 7, 1864, a date shared with a much more famous event in American military history, Pearl Harbor. Warren’s infantry followed two hours later. Crawford’s Division was in the lead, followed by Griffin, Ayres, and Mott in that order. After marching down the Jerusalem Plank Road, the column crossed the Nottoway River around 5 p.m. at Freeman’s Ford, the same crossing point used by Wade Hampton during his Beefsteak Raid back in September 1864. By that point, Gregg’s cavalry had already moved ahead several miles south to Sussex Court House. At the end of this first day, Warren’s column was strung out, divided by the Nottoway River. Griffin and Ayres were still north of that waterway, with Mott and the supply train just to its south, and Crawford and Gregg in the lead at Sussex Court House. Luckily for Warren, A. P. Hill’s intercepting force was nowhere near and therefore not in a position to take advantage of Warren’s vulnerable and strung out column. He had assembled the equivalent of two infantry divisions, with units pulled from all three of the divisions of his Third Corps, Army of Northern Virginia. This force settled down for the night in the Burgess Mill area south of Hatcher’s Run, the site of the October 27, 1864 battle during the Sixth Offensive. Wade Hampton’s Confederate cavalry was also busy. Once the South Carolinian found out Warren was headed south with a strong force, he rushed the brigades of Barringer (Rooney Lee’s Div.) and Waring (Butler’s Div.) to Hicksford in an attempt to block the head of Warren’s column. OR XLII, P3, pages 804–987: Once you’ve read my admittedly simplistic overview of this operation, be sure to check out (for free on Google Books) the various communications between Union commanders over this week or so period in early December 1864. OR XLII, P3, pages 1256–1271: And once you’ve read the Union reports, be sure to check out (for free on Google Books) the various communications between Confederate commanders over this week or so period in early December 1864. The number of surviving reports is much, much lower, but you still at least get a sense of how the Confederates responded to Warren’s Raid.